The alphanumeric keys is the are of keys in the keyboard which looks like a typewriter. These keys are arranged in the same way in .almost every keyboard. That common arrangement is called QWERTY. The SHIFT, ALT and CTRL keys are called the modifier keys. 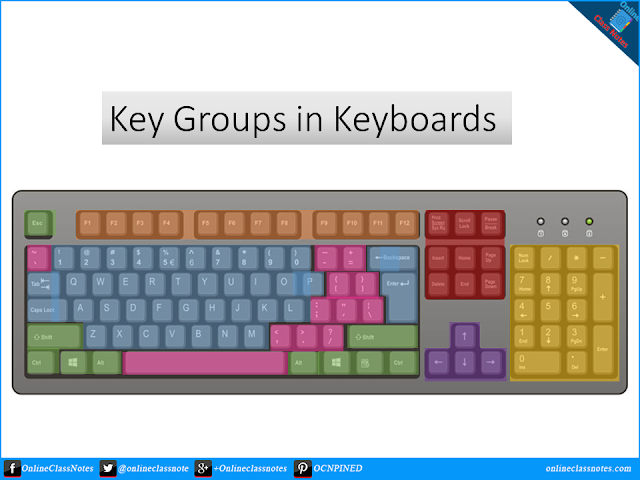 Because these keys modify the default input of other keys when pressed together. For example, while the SHIFT key and the alphanumeric key 'a' are pressed together the input becomes a upper case 'A' rather than the default lower case 'a'. Though the alphanumeric keys includes all the numeric keys, still in an standard keyboard there is a separate place of numeric keys, this section of the keyboard is called the Numeric Keypad. It is generally located at the right-most side of the keyboard. It is like calculator keypad. It contains number keys (0,1,2,...,9) and mathematical operator keys (+,-,/,*). There is also an extra ENTER key and a dot (.) key for decimal numbers along with a NUM LOCK key to lock and unlock the keypad. The numeric keypad behaves as arrow key set when locked with NUM LOCK. The function keys, which are labeled as F1,F2,...,F12 are located in a row at the top of the keyboard. These keys allow user to input commands without typing long strings of characters. For example, if we press the F1 key, in most programs it will open the HELP DOCUMENT of the program. There are four keys labeled with arrows (left, right, top, bottom) which are the arrow keys. These keys help in navigation. For example, when in a document or text, we can move the cursor in the fours sides using the four keys. Again, when in a menu, we can navigate the items using the four keys. There are 8 special purpose keys. These are INSERT, HOME, PAGE UP, PAGE DOWN, DELETE, END, logo key and the menu shortcut key. These are the punctuation markers, thus these are called the punctuation keys, such as comma (,), semi-color (;) etc.